Don't be fooled: This is not Tony Stark's latest bionic arm. 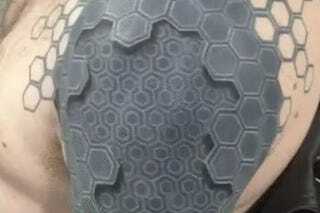 It's an incredibly detailed tattoo, one whose proud owner looks like he just stepped out of Neuromancer. The tattoo was inked to life by Tony Booth, who runs Dabs Tattoo in Southport, England, along with his wife. Booth, known for his complex, geometric designs, outdid himself with this particular tat, which took over 18 months to complete. That may sound like a long time to spend under the needle, but now this man gets to walk around garnering the jealous stares of would-be cyborgs for the rest of his life.